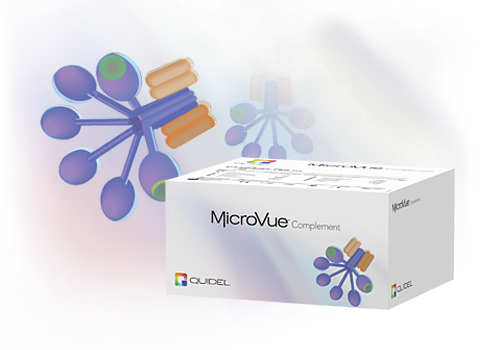 The MicroVue CIC-C1q Controls are intended for use as controls in the Quidel CIC-C1q EIA. This assay is for detection of circulating immune complexes (CIC) in human serum or plasma. The range of expected microgram equivalents per milliliter (µg Eq/mL) of CIC present in the Controls, when assayed with the MicroVue CIC EIA, is shown on each vial label. Elevated circulating immune complexes (CIC) have been detected in serum or plasma obtained from patients with a variety of diseases, for example, from patients with autoimmune disorders, leukemia, various cancers, bacterial and viral infections. CIC determinations can be important in the diagnosis or prognosis of certain diseases (e.g., SLE and rheumatoid arthritis). Several assay techniques such as the Raji Cell Assay, C1q deviation test, conglutinin test, fluid phase C1q binding procedures, rheumatoid factor assay, PEG precipitin test, and solid phase C1q assays have been described to detect or quantitate CIC. The MicroVue CIC EIA uses human C1q in solid phase to capture CIC. All Controls are shipped on dry ice and must be stored at –20°C or below. Abrass, C. Nies, K., Louis, J., Border, W.A. Glassock, R.J. Correlation and Predictive Accuracy of Circulating Immune Complexes with Disease Activity in Patients with Systemic Lupus Erythematosus, Arthritis Rheum., Vol. 23, p. 273, 1980. Duqesnoy, B. Circulating Immune Complexes and Complement in Rheumatoid Arthritis, Ann. Biol. Clin. Vol. 42, p. 71, 1984. McDougal, J.S., McDuffie F.C. Immune Complexes in Man: Detection and Clinical Significance, Advances in Clinical Chemistry, Vol.24, p. 1, 1985. Theofilopoulos, A.N., The Raji, Conglutinin, and Anti-C3 Assays for the Detection of Complement Fixing Immune Complexes, Methods of Enzymology, Vol. 74, p. 5111, 1981.